When I drive a McLaren, I remember how I imagined the experience of driving a sports car when I was a child, long before I'd ever driven any car. I couldn't know it at the time, but the car I imagined hadn't been created yet. I imagined the engine being loud but not terrifying; that turning the steering wheel would provide the sort of immediate response I got when turning the handlebars of my bicycle. At the same time, it would not be raw or harsh. I imagined it to be like a highly civilized go-kart. The McLaren 720S is that idea perfected. It's fast, precisely loud enough, precisely refined enough and it's all wrapped in a space alien body that looks like no other car on Earth. Press the gas, and the car's turbocharged 4.0-liter V8 engine, capable of producing 710 horsepower, slams your head into back of seat. Sixty miles an hour can be reached in less than three seconds. Mash on the brake pedal and the wing in the back flips up to catch the air like a parachute while also grinding the back wheels into the pavement for greater stopping power. 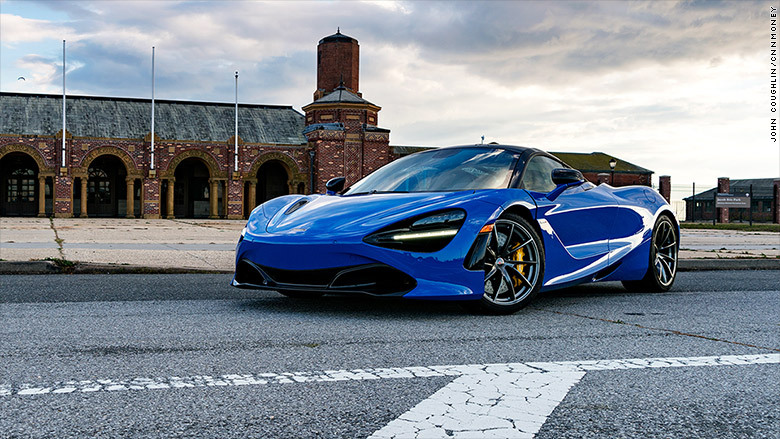 The McLaren 720S can get to 60 miles an hour in under three seconds. The ride is firm -- your rear-end is, after all, roughly dachshund-height off the ground -- but not punishingly so. The transmission shifts are quick and smart but never jarring. (Like most supercars, McLarens have automatic transmissions with paddle shifters.) Steering responsiveness, suspension stiffness and engine behavior can all be set using knobs. That's not a terribly novel idea but the ease with which it can be done using readily accessible knobs is. Press a button and the knobs are active, press it again and all the settings return instantly to the default mode. An automated wing at the back of the McLaren 720S rises to help braking. The niftiest feature is the gauge cluster. It's a computer screen or, rather, two of them. In normal driving mode, you see a big screen with all the driving information you could possibly need and a lot you probably don't. Put it in Sport mode and, to minimize distractions, the screen flips down revealing a much narrower display along what had been its top edge. That narrow screen shows you just what you really need. The car's speed down the road, the engine's running speed and what gear the seven-speed transmission is in. 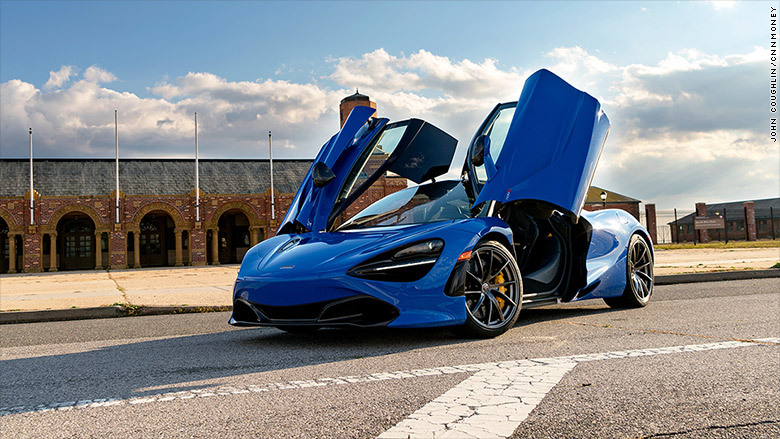 The doors of the McLaren 720S are hinged to open upward and forwards. 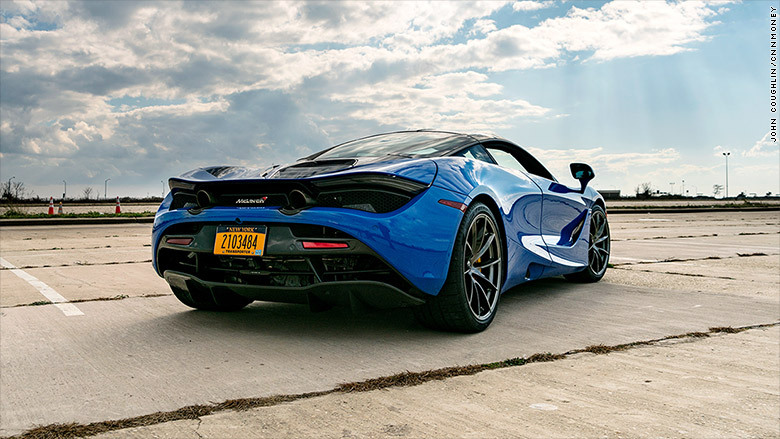 The experience is very similar in the less expensive McLaren 570S. By less expensive, I mean $190,000 versus $290,000. Less expensive does not mean inexpensive. That $100,000 saved means considerably less horsepower, albeit still a bunch by any normal standards. And the 570S is still very quick with a zero-to-sixty time, as measured by Car & Driver, of an even three seconds. And it still offers that unique McLaren experience which is to say, it's about as sports car as any sports car has ever been.